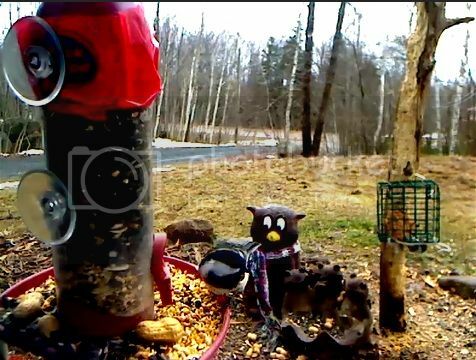 NovaBirds Cam Blog: (Temporarily) Warmer weather! ..Wait.. isn't tomorrow February 1st?! After at least two weeks of miserably cold weather (-29C/-20F), we're finally getting a break. What a shock to wake up to all of the snow being melted away, and the thermometer reading +17C/62.6F. We went from needing to wear at least 3 layers of clothes, to being able to walk out the door in a t-shirt and undies (as my husband did this morning to take out the trash!). It's really nice to have a break in the snow and cold. It's pretty uncommon to have such a "balmy" day during a time of year when we're usually experiencing our coldest weather! We have to enjoy it while it lasts though..it's forecast that the cold weather will be back by Saturday.